‘American Sniper’ shattered box-office records over the weekend, earning at least $90.2 million between Friday and Sunday. However, in Hollywood, not everyone is hailing the biographical war drama based on real life events. The Clint Eastwood-directed feature, which opened in major American theaters on Friday, utilizes the 2012 best-selling autobiography penned by former United States Navy SEAL Chris Kyle, projecting it onto the big screen, and presents audiences with a motion picture depiction of the man called the deadliest sniper in US military history. Notwithstanding a sensational weekend at the box-office, some celebrities are now saying the film all too grossly glorifies war. Seth Rogan, the star of another movie that recently made waves in its own right, ‘The Interview, said on Twitter over the weekend that “American Sniper” reminds him of a faux Nazi propaganda movie shown during Quentin Tarantino's 2009 movie Inglourious Basterds. Filmmaker Michael Moore, whose documentary on the War on Terror, ‘Fahrenheit 9/11’, became the highest-grossing film of its type ever, took heat over the weekend after writing from his personal Twitter account that he was taught “snipers were cowards.” His remark soon after ended up being lumped together with criticisms concerning the Eastwood-directed movie, which he later wrote on Facebook was of a different context. 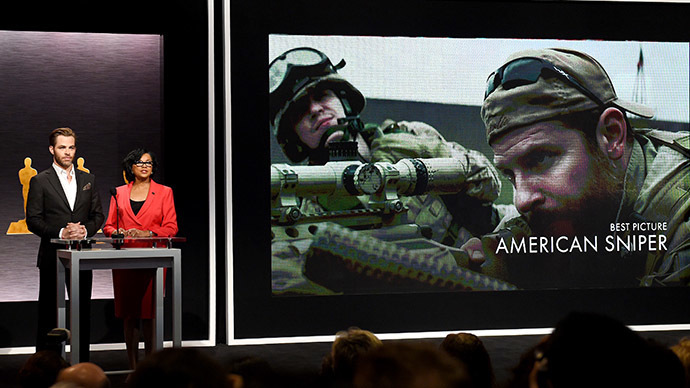 “If they wanted to know my opinion of ‘American Sniper’ (and I have one), why not ask me?” Moore posted on Facebook on Sunday, adding that he thought actor Bradley Cooper’s performance was “one of the best of the year,” albeit in a film not without its faults. Indeed, RT wrote previously that Kyle, the “deadliest sniper” portrayed in the film by Cooper, was killed in February 2013 when he was shot-down at a Texas gun range. Not everyone on Hollywood’s left is coming after the film’s storyline, however. Actress Jane Fonda, who made headlines in the 1970s for her opposition to the Vietnam War, wrote on Twitter, that Cooper did a “sensational” job in what she called a “powerful” film. US Vice President Joe Biden had other, equally strong words, for the movie. “It’s intense, man,” Biden said after attending the recent Washington, DC premiere of the film, according to The Daily Beast. “My hope is that if someone is having a political conversation about whether we should or should not have been in Iraq, whether the war is worth fighting, whether we won, whether we didn’t, why are we still there, all those [issues], that really – I hope – is not one that they would use this movie as a tool for,” Cooper previously told The Daily Beast. According to early estimates, ‘American Sniper’ may gross as much as $105 over the three-day holiday weekend – shattering records for previous openings held on Martin Luther King Day weekend and all other weekends in January, according to USA Today..